DECISION COMING BY JUNE 5: The City Attorney of Berkeley, along with the City Manager and director of Planning Department must make the decision on the fate of West Berkeley Shellmound and Village Site. 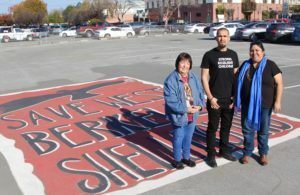 WE NEED YOU to send an email demanding that Berkeley city staff do the right thing: Stand with the Ohlone people, protect a designated landmark, and honor many city resolutions supporting the rights of indigenous peoples. Click here to send an email. Phone calls are also effective. See numbers to call below. For more detailed information on the issue and the developers’ disinformation campaign, please read the last blog post. You can also learn more and donate to the effort to save the shellmounds here. Following is draft language for a letter or email. Please personalize it for greater impact. Suggested subject line: Do the right thing and stand up for native people. As I am sure you are aware, the West Berkeley Shellmound site is listed on both the California Register of Historic places and was designated as a Berkeley Historical Landmark in 2000. That would not have happened if archaeological artifacts were not present on the site. This site is 4,700 years old and continues to be used as a ceremonial site by the Ohlone people of the Bay Area. What purpose does it serve to have designations of historical landmarks if we do not respect and protect their status? Berkeley is a community rooted in shared values, equal access, and enjoyment for all. We must preserve this historic site as open green space for the enjoyment and education of all, and as a sacred ceremonial site. For the Ohlone, destroying this historic burial ground is equivalent to demolishing Grace Cathedral and digging up the Arlington Cemetery. Please reject fast-track approval of the 1900 Fourth St. project. It is illegal and indefensible. Approving it will surely bring a winning lawsuit by the Ohlone, an egregious waste of taxpayer dollars. Do the right thing and stand up for native people. Other suggested language if you wish to get into more detail. Please personalize your letter, adding your own story and feelings. If you are a Berkeley resident, it is important to note that. I am writing to you today to express my opposition to the development at 1900 Fourth Street on the site of the West Berkeley Shellmound and Ohlone Village. [I am a Berkeley resident.] I have been deeply moved by Ohlone leader Corrina Gould and I urge you to do the right thing and protect the historic landmark Ohlone shellmound village site. I support affordable housing but 1900 Fourth St. is not an appropriate place for it. This is an historic site, landmarked by the city, eligible for the National Register of Historic Places, a 4,700-year-old archaeological site, encompassing a once thriving village that is still sacred to the Ohlone people. Please honor history, indigenous rights, and the values of the Berkeley community. Berkeley demonstrates our support of and pride in the legacy and heritage of the Ohlone people through numerous City Council resolutions, the Ohlone Greenway and Indigenous Peoples’ Day. However, if the development at 1900 Fourth St. is approved, it will be a slap in the face of the Ohlone people who are living and practicing their traditions today in the exact location where their ancestors are buried. It will signal that the city of Berkeley prefers a romantic and historic preservation of the Ohlone, but does not truly support the community and our city’s heritage. I pay my taxes and I support you defending the site from desecration and development. I do not want my tax dollars wasted should the city be sued by the Ohlone on account of a terrible and likely illegal decision. SB 35 does not apply to historic structures that are landmarked under city, state and federal law and this site is recognized by all three. An archaeological site is a structure and so is a shellmound—the fact that it was carted away to pave our streets does not diminish its historic value and some of it is surely still underground. Please rule that SB 35 does not apply to 1900 Fourth St. This permit should not be fast-tracked. Please follow the law. The Ohlone have a much better vision for the property that celebrates their continuing traditions and spirituality. The city should partner with them to build an open space memorial park and museum that would benefit and educate all residents of Berkeley and the rest of the country. Our grandchildren will thank you for having a park and educational space on Fourth Street to honor the native people who were the first human inhabitants of Berkeley rather than another large building benefiting and profiting only its owners and a few residents. The values of the people of Berkeley have long reflected a desire to honor its history as well as its diversity and this Fourth Street site is worth the cost of a lawsuit by the developer, not the Ohlone, as was the historic post office and its preservation. I hope you will rule to be on the right side of history in preserving this historic site.